So for whatever reason, you may be thinking about making a switch from weights to calisthenics based workouts. Maybe you’re looking for something new, or perhaps life isn’t allowing you to get to the gym. Whatever the reason, the pull-up bar is calling your name and the barbell feels like it’s less appealing each week. Despite the allure of not needing to train in a gym, you may feel a little nervous about losing some strength and muscle when you trade the bench press for push-ups. It’s a fair concern as many people who’ve switched from weights to body weight in the past have experienced some loss in during the transition. Well, not to worry my friend because I’ve got 4 solid tips right here that will not only help you make a smooth transition from weights to calisthenics. These tips will not only help prevent you from losing muscle and strength, they will also help you achieve more than ever before. 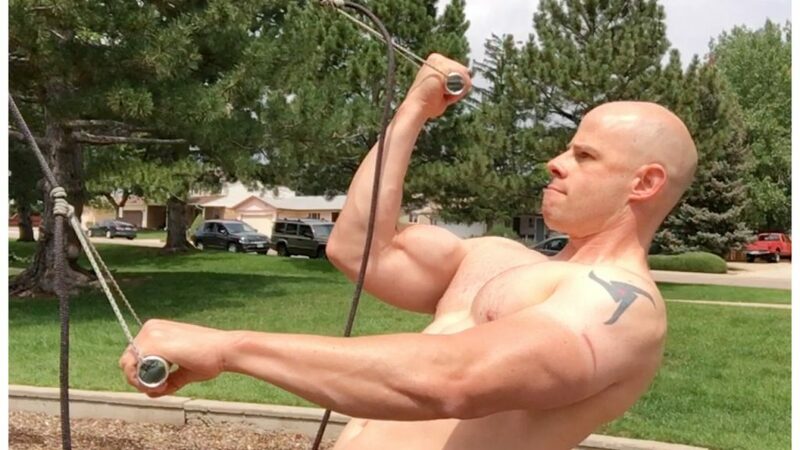 Most of the folks who change weights for calisthenics fail because they don’t understand how to progress their training. If you want to truly take your bodyweight training to an elite level you’re going to have to learn how to train beyond the basic push-ups and crunches you learned back in gym class. Building muscle and strength with calisthenics isn’t that different from building it with weights. You’re still using progressive tension to work your muscles harder over time. The only difference is how you do that. 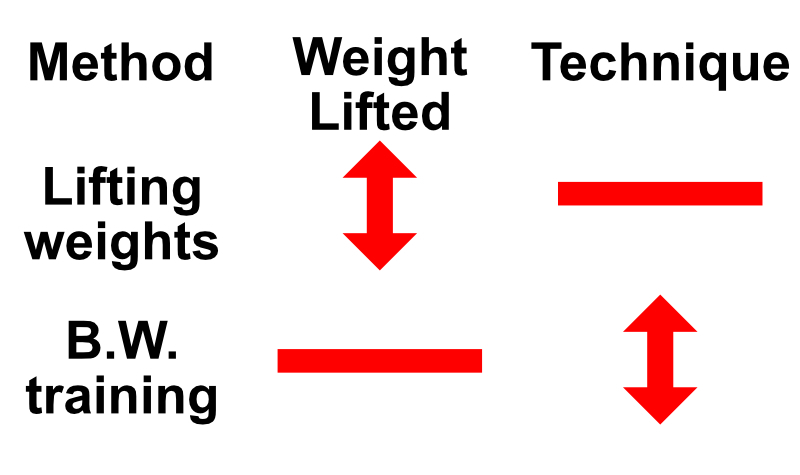 With weight lifting, you change the weight you lift while keeping your technique fairly constant. With calisthenics, you change your technique while your weight stays consistent. The major difference between lifting weights and calisthenics is in how you adjust the difficulty of the exercise. Learning how to adjust the difficulty of any bodyweight exercise is the key to achieving your goals even beyond weight lifting. My YouTube channel has loads of videos that can help you do just that. I also recommend the books Convict Conditioning, C-Mass and Get Strong as a good place to start learning about proper progressive calisthenics training. It’s easy to get lost in the deep ocean of bodyweight training with many different training styles to choose from. There are more types of push-ups out there than there are types of snack cakes at the local 7-11. Don’t feel like you need to do every type of exercise and variation when strength and muscle are your goals. Make the basic power moves like push-ups, dips, pull-ups, lunges, bridges, and hand stands your staples. Also, invest in a good set of rings or a suspension trainer to make basic moves easier or more challenging. You can also do bodyweight versions of many weight machine exercises like curls and triceps extensions on them. You can check out one of my best home made suspension trainers here. You don’t have to quit the weights cold turkey and change over to bodyweight training right away unless of course life requires it. Mixing body weight training and weight together has always been a good idea and you can gradually emphasize calisthenics as you feel comfortable with it. A good way to do this is to switch one weights workout a week with one bodyweight version. Then switch to two body weight workouts a week and so on. You can also change out single exercises at a time like changing out pulldowns and cable rows for pull-ups and rows on rings. Changing from weights to calisthenics is sure to expose some inherent weaknesses in either capability or muscle balances. You may notice your triceps work harder than expected during push-ups or your hip stability is challenged during lunges. It’s tempting to try and work around these issues and claim that the exercise isn’t suitable for your goal. In these cases, you might claim narrow push-ups are not good for the chest and lunges are too much of a balance exercise to work the quads. That may be the case for now, but it won’t stay that way for long. If you continue to practice those moves, you’ll find your triceps will get stronger and your balance will improve. Once that happens, those weak links won’t hold you back anymore and close push-ups will be great for your chest and lunges will set your quads on fire! Lastly, don’t feel like you have to give up the weights entirely if you don’t want to. Unless there’s something forcing you to only use bodyweight training you can mix the two together as you wish. Whatever you do, just remember that consistency and progression should always be your focus no matter what methods you use.